"Frankie and Taryn did an amazing job on our wedding! I had some ideas that I was hoping for, but incorporating sunflowers into everything was really important to me. I sat down with them and talked about my ideas, and what I was aiming for, Frankie really helped me explore options that worked with my vision. Day of, my bridal bouquet was BEYOND gorgeous, my bridesmaids bouquets matched their dresses perfectly, down the aisle she put sunflower heads (what a creative idea! ), and the arch... Words can not describe how stunning it was. All my guests wanted pictures in front of it. The feel of the reception was like being lost in a romantic secret garden. High and low centerpieces created depth; and candles, and small trees were placed perfectly that my guests were raving about them. Such Talent! They deliver, set up, and pick up without me having to worry about anything. 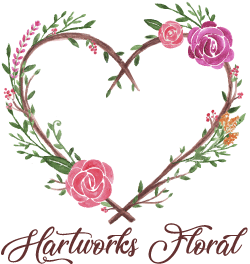 Business with Hartworks Floral was easy and effortless. I can not stress how glad I am that I gave Frankie my business.